Let's be honest and upfront right from the start: you don't want to read this, and I don't want to write this. I would so much rather be writing about how the Tigers of 2016 are a nearly-unstoppable force, a dangerous team that only needs one or two tweaks -- maybe a bench bat, or an average reliever who could take the seventh inning from time to time -- in order to become World Series favorites. But that's not the reality of 2016. The reality of 2016 is that the Tigers are slightly better than they were in 2015, but nowhere near as good as they were in 2013, and they're probably even slightly worse than they were in 2014. It's time to sell a few more players and collect a few more prospects to "reload" for 2017. Can we just embrace this fact already? Can we stop with the way-too-simplistic explanations and super-easy solutions that envision this team magically going from being lukewarm slop to being a gourmet meal? Yes, I know their 46-43 record turns into an amazing 45-32 (.584 win percentage) when you get rid of the Cleveland games. That's hardly a ringing endorsement, though. When the Tigers were actually a good team, they dominated the Indians. In their division-dominating run from 2011 to 2014, they were a combined 46-28 against the Indians. They're not beating the Indians anymore, and the simple reason is that they're just not as good of a team right now. Take that imagined 45-32 record this year against teams not named The Indians. Now take away the two-series sweep of the crappy Minnesota Twins, as well as the 6-1 record against the basement-dwelling Rays. Now we're looking at a 33-31 record. Take away their easy man-handling of the not-very-good Marlins and the seriously-slumping-at-the-time Mariners, and now their record is 25-33. The fact is, when the Tigers play good teams, they don't win. When they play the teams they'd most likely be facing in the postseason -- the Orioles, the Blue Jays, the Rangers, the Astros, the defending champion Royals -- they're 7-17, and that's before we factor in the Indians. How well do we expect them to fare in their upcoming 28 games against the Royals, Red Sox, Orioles, Rangers, and Astros, not to mention seven more against the Indians? This is an average-to-barely-above-average team, not a postseason contender. But could the trade deadline change that? Buying at the deadline means trading away some prospects. That, quite frankly, is a foolish idea for an organization that had run out of both money and prospects last year, and only recently started trying to rebuild the farm system. If they're going to buy, they need to buy big. Like, Sonny Gray big. Picking up a mediocre starting pitcher like Jeremy Hellickson at this point isn't going to do much, not when the current rotation is Justin Verlander, Michael Fulmer, a twice-injured Jordan Zimmermann who is wearing a big question mark on the back of his jersey, and then the howling nothingness of The Void. This team needs an ace, much in the same way that the 2015 Texas Rangers saved their season and went from last place to Division Champions by picking up Cole Hamels at the deadline. And even then, it took them two months to secure and hold first place, only to be bounced out of the playoffs in the first round. The point: this very mediocre team could just as easily luck into a wild card spot by standing pat at the deadline as they could by swapping prospects for pocketfuls of "Meh," so why bother? Great idea, except that buying an ace like Sonny Gray right now means gutting the farm system. Say goodbye to Norris, Boyd, Jimenez, Jones, etc. That is precisely the opposite direction the organization should be going. What they need right now are more prospects. Everyone, and I mean everyone, is looking for starting pitching right now. The Royals need help, the Red Sox need help, the White Sox just voluntarily added James Shields to their rotation. I went to the store for some bananas and milk yesterday and somehow I ended up buying a starting pitcher in the process. Which means that this is a great time to try and move Anibal Sanchez, and possibly Mike Pelfrey as well. Yes, Sanchez has been stinking in 3D at full volume for over a year now, but he's only got one year left on his contract, and there's always one team out there with just enough hubris to say "we can fix him." True, the Tigers may not get much in return for Sanchez, but getting anything at this point -- along with getting his $17 million dollar contract off the books for 2017 -- would be better than keeping him on the roster to be the world's most highly-paid relief pitcher in 2017. Call Dave Dombrowski in Boston. He traded to get Sanchez back in his days with Detroit, maybe he'd be willing to let the Tigers dip in the rich Red Sox farm system on the off chance that Sanchez can be cured. I'm not suggesting a fire sale, where the Tigers offload Miguel Cabrera, Justin Verlander, Dan Dickerson, Mario Impemba, and the left field scoreboard. That would also be foolish, and it would be many, many years before watching Tigers baseball would be fun again. I'm suggesting mostly standing pat, getting rid of zero prospects, and trying to dump a few starting pitchers in the process. Daniel Norris and Matt Boyd may not be adequate replacements for Anibal Sanchez and Mike Pelfrey, but who am I kidding, yes they absolutely would be. You're as likely to catch a wild card spot with Norris and Boyd at the back of the rotation as you are with Pelfrey and Sanchez, maybe even more likely. Unlike last year, this does not mean trading off stars like Yoenis Cespedes and David Price, then turning off the television in August and not turning it back on again until the next spring. 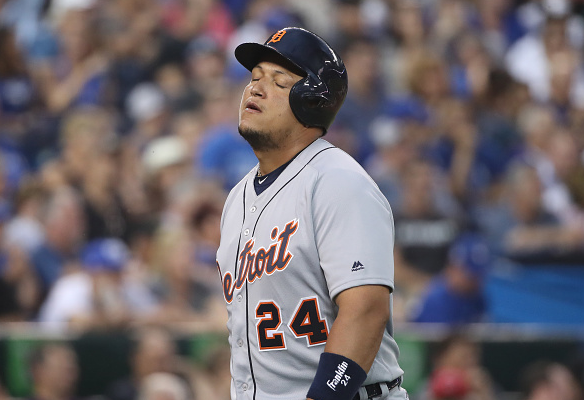 The Tigers can still be the same old Tigers, winning five and then losing six, beating up on awful teams and then losing to true contenders, and we can all keep cheering them on to that possible one-game matchup at the end of the year. But getting rid of prospects? Now? For this crew?